Big Bird is one TALL bird, isn’t he? He must be nearly ten feet tall! Your little guy has a lot of growing to do if he wants to catch up to that big yellow lovable goof! You better teach your child to eat his vegetables and get plenty of exercises if he wants to grow up big and strong like his favorite Sesame Street character. (Of course, Big Bird will be sure to help out by teaching him his ABC’s!) Now, getting fuzzy yellow feathers might something a little out of your control. That’s where we come in! You see, we know costumes. We’ve scoured the earth to find the best of the best and we love Big Bird about as much as your little one does, so outfitting your child with something that’s fuzzy, yellow and officially licensed from Sesame Street is a piece of cake for us! 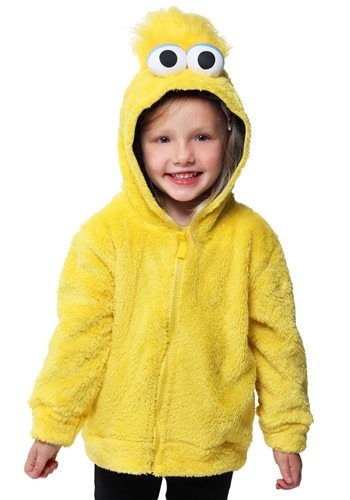 This Big Bird faux fur costume hoodie has an ultra-soft, faux fur exterior that mimics the look of the iconic character from the show! It zips up in the front, so it’s quick to put on and it’s cozy. It also has big plush bubble eyes on the top and some yellow tufts of faux fur on the top. The best part about this hoodie is that your child can wear it even when they’re not headed to a costume party! It works as an everyday hoodie to wear when the weather gets a little chilly.